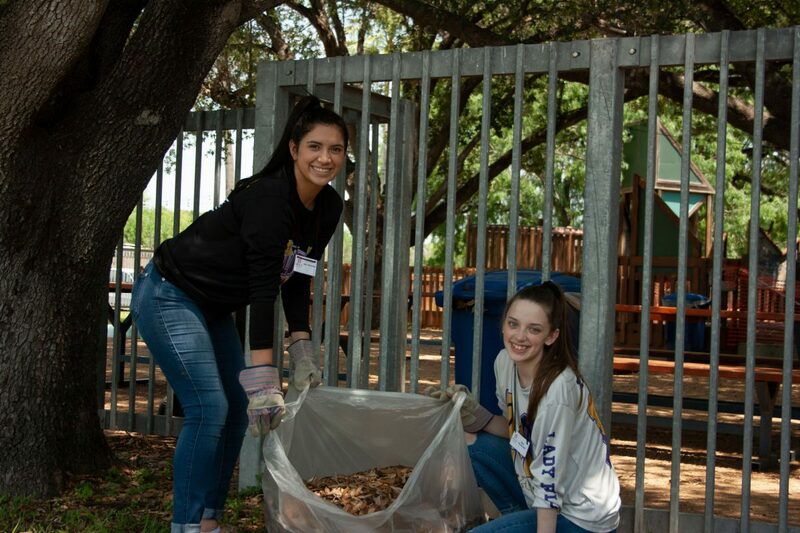 Volunteers assisted in racking up leaves near the Rio Scape playground at the International Museum of Arts and Science (IMAS) in April during the Volunteer South Texas Week 2018. McALLEN — As school year winds down, students looking for ways to keep busy during the three-month summer break now have help finding volunteer opportunities. The United Way of South Texas can match volunteers with opportunities during the summer months, as well as throughout the year. It all begins with a simple online platform organized by the organization that serves both Hidalgo and Starr counties called Volunteer South Texas. There, in a few simple steps, someone’s spare time can be made valuable to a local nonprofit organization. Eloise Montemayor, community relations and public sector associate for United Way of South Texas, said Volunteer South Texas is a resource to connect agencies to volunteers. 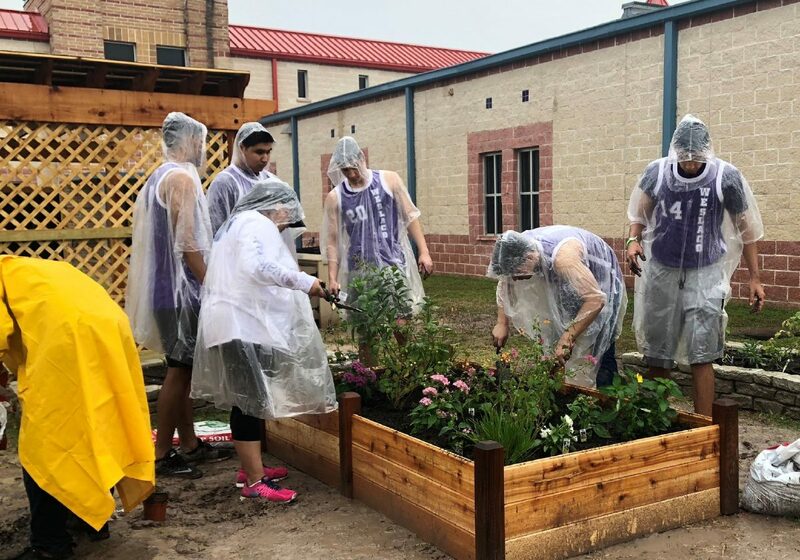 Students from Weslaco ISD assisted in making the landscape greener by planting some trees in a planters box in April during the Volunteer South Texas Week 2018. Since the program launched in the fall of 2015, 130 agencies have registered through United Way of South Texas in search of volunteers. The following year, the volunteer program merged with the University of Texas Rio Grande Valley-Office of Student Academic Success Engaged Scholarship & Learning to broaden volunteer opportunities to university students. Some of the agencies that have listed their needs are International Museum of Arts and Science, Boys & Girls Clubs of the Rio Grande Valley and The Salvation Army, among others. Most of the agencies posted through Volunteer South Texas are nonprofit organizations within the area. The registration asks simple questions, but all that is needed is a working email address and a password to enter the portal. One agency that has benefitted from Volunteer South Texas is the International Museum of Arts and Science, who relies on volunteers to assist with museum duties. Claudia Martinez, IMAS volunteer and marketing coordinator, said they get the most volunteers through the university. The minimum age to volunteer at the museum is 16, but in some cases agencies require they be 18 years and above. Details about volunteer requirements are listed on the website. “We usually have anywhere between 30 to 45 volunteers around each (school) semester and the summer we will have more for the summer camps and probably higher end of the 40s, but throughout the year, it stays in the 30s,” Martinez added about the volunteer impact. Additionally, Martinez said volunteers enter the museum shy and unsure of their future, but when they end their term, whether it’s a year or longer, most volunteers show growth and leave with confidence. If you would like more information on United Way of South Texas and how to volunteer visit, www.unitedwayofsotx.org or call their office at (956) 686-6331.